We feel proud to represent Bengali Club & Youngmen’s Association, which is in the 125th year of its existence since its inception in the year 1892. Our Club is registered under Societies Act XXI of 1860. Our main aim is to render cultural and social services in the state of Uttar Pradesh. We are the oldest club in the city and Mother Organisation of entire Bengali community. We had the privilege to honour Netaji Subhash Chandra Bose in the year 1938. Bengali Club & Youngmen’s Association was established on 29th September, 1892, marking the birth of an educationist & a social reformer with modern vision- Pandit Ishwar Chandra Vidyasagar. We will be celebrating 125 years of our foundation this year, also known as Prathistha Divas. We are looking forward to your support in joining hands with us, for a grand celebration marking another milestone in the magnificent history of Bengali Club & Youngmen’s Association. The club was a result of a longing in the heart and dream of one man, Shri Atul Krishna Sinha, who simply wished to establish a place for Bengali performing arts and indoor games for all. Soon this stalwart's wish became a reality when he, along with his well-wishers established this club, which is now Lucknow's iconic Bengali Institution and a platform for performing arts in every way. Our story begins with a youthful and energetic Sri Atul Krishna Sinha obtaining employment in the Indian Railways engineering department and then coming to Lucknow in 1901. As a popular saying goes, 'where there is a will, there is a way,' this young lad was extremely fond of Bengali theatre and art. With time, Sri Atul Krishna Sinha's yearning started escalating and be started dreaming of establishing an institution for the same. To give the dreams a shape, Sri Atul Krishna Sinha and his friends soon founded the second Bengali institution in Lucknow called The Bengali Club. (The first one being 'Bengali Youngmen’s Association). Initially the club was located in the house of Sri Manindra Krishna Basu, from where it shifted to Mr. Chatterjee's dwelling on Hewett Road. As time passed, the club was again shifted to the house of famous Vidyanto Bonsho and then to Sundar Bagh, before moving to Shivaji Marg. But Sri Atul Krishna Sinha wasn't too happy, in spite of the club getting its due recognition, his dream was to have an independent place dedicated solely to Bengali Club premises. His wishes were heard and very soon with the help of a renowned businessman Sri Saligram and along with his colleagues, Sri Atul Krishna Sinha was able to purchase a place on Hewitt Road that is the present Shivaji Marg. Moving on, in 1914 the foundation stone of the club was laid and names of those who helped in the establishment of the Club are inscribed on the stone. Some of these significant members were Sri Manindra Krishna Basu, Sri Sharada Prasad Bandhopadhyay, Sri Sharat Chandra Bandhopadhyay, Sri Nagendra Krishna Basu and Sri Debendra Krishna Basu. Thus, the club started at its new place. Initially there was just a large room (At present the Table Tennis Room) and a stage and the very first Shree Shree Durga Puja was started by Sri Atul Krishna Sinha in 1914. This celebration was grand and till date continues to be the same. Since its initiation, the best of Bengali play's were staged and grand celebrations were held in full swing. Some of those people whose dramatic works were appreciated at that time were Sri Atul Krishna Sinha, Sri Bireshwar Chattopadhayay, Sri Krishnadhon Chattopadhayay and Sri Suren Rai. Both Bengali Club and Bengali Youngmen’s Association were flourishing simultaneously at that time. However, Sri Atul Krishna Sinha's untimely death was a great loss for the club, Sri Atul Krishna Sinha was the Life Secretary of Bengali Club. 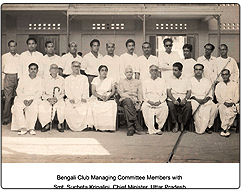 Bengali Club and Bengali Yougmen’s Association had to be merged into one single institution called The Bengali Club and Youngmen's Association in January 1929, due to numerous financial reasons. The club was then registered under the Societies Registration Act XXI of 1860. The first elected President of The Bengali Club and Youngmen's Association was Sri Atul Prasad Sen and its secretary was Sri Amar Nath Basu. As time moved on, the club's reputation grew and the stage started seeming small for the festivities and there was an urgent need for a puja mandap. It was the then club's President Sri. Shailendra Nath Sanyal and the present secretary Sri Mrinal Kumar Sen got the Puja Mandap built in memory of their father’s respectively. Finally, the club's Assistant secretary Sri Dwijendra Nath Sanyal took the initiative and got the club Stage named ‘Atul Natya Mandir’. Bengali Club and Youngmen's Association's performing stage was later christened as 'Atul Sinha Natya Mandir', in the memory of the man who dared to dream and gave Bengali's in Lucknow a ray of hope. The club’s ex- President Sri Binoyendra Nath Dasgupta took the initiative with full eagerness and got the audience seating area's roof covered. We are extremely blessed & grateful to all our well-wishers, without whom Bengali Club wouldn’t have gained glory, in its 125 years of existence. Each one of you has been a key contributor in celebrating our milestones from 100 years of Shree Shree Durga Puja in 2014, 50 years of All India Prakash Chandra Ghosh Memorial Full Length Bengali Drama Competition in 2013, to 50 years of ‘CHANDIPATH’ Mahisasura Mardini in 2013.